From the moment the business is merely an idea through handing it down to the next generation, Bert Brannon helps clients make sure they have a solid foundation, a clear direction and a plan for keeping their families’ futures secure. A veteran attorney who has served the Midlands for more than 20 years, Bert’s primary practice areas are estate planning and business succession planning, areas that typically are tightly tied for most small business owners. His practice also includes probate and trust administration; choice of entity planning; taxation of estates and trusts and business entities; and corporate law. For the many small business owners he represents and counsels, he begins by helping them select the proper entity upon formation, whether that’s a publicly or privately held corporation, a general or limited partnership, a closely held corporation, a family-run company or a sole proprietorship. He also works with many charitable entities, assisting them in obtaining tax-exempt status. As business matters naturally flow into personal issues, Bert assists clients with a range of estate planning matters, from writing wills to creating trusts. He helps with powers of attorney and advance directives, including living wills and healthcare powers of attorney. He has represented trustees and personal representatives for estates, helping families after the death of a loved one. He also has served as a trustee for various trusts and as a special administrator and personal representative in special situations and contested estates. 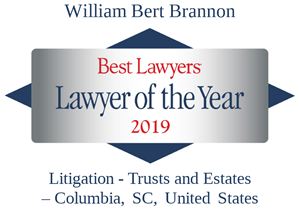 A graduate of the University of South Carolina School of Law, Bert is a South Carolina Supreme Court certified specialist in estate planning and probate law. He’s written on the topics, co-authoring a chapter on will and testamentary trusts in Estate Planning in South Carolina, Volume II. 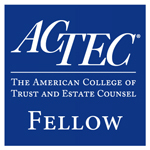 A member of the Columbia Estate Planning Council and fellow of the American College of Trust and Estate Counsel, he frequently lectures on the topics as part of the South Carolina Bar’s continuing legal education program. He’s also an adjunct professor at the University of South Carolina School of Law, teaching estate planning.